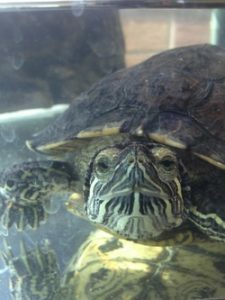 It’s always funny to talk about Turtle Dance Music with people and say, “We’re Turtle Dance Music and we help kids come out of their shells.” What people may not actually know is that my Mom owns two pet turtles. Their names are Rex and Roxy. They are both red-eared sliders that my Mom bought in New York and Philadelphia while I was a student at New York University. My father and I advised her not to buy them because we didn’t think they would live very long. Six-years later, we were both wrong. These turtles grew from the size of the head on a small spoon to a size bigger than my own foot or hand or a small plate. What’s also interesting is that my Dad owns a construction company named MugRose Construction – named after my Mom’s two former turtles Mugsy and Rosey from when they were first dating (seeing a trend? Father and son naming their companies after mom’s turtles – hmmmm – just realizing that in this blog post). But here is what’s amazing about Rex – he dances. Nobody taught him how to dance. He dances whenever he sees Roxy. He loves her! But she doesn’t love him. But he keeps trying. And every time he sees her, he goes into his dance mode – he’s a slick cool guy. He’s the turtle that he ultimately envisions he wants to be. When she ultimately rejects him, he goes back to being his normal goofy self and comes over to me or my Mom or my Dad and hangs out on our feet – or climbs on us (we make a little bridge with our legs and help climbs up the way up to our shoulders!). Rex acts like a dog. He is so much more than a turtle. Watch the video below of Rex following me across the room. It will change your perception of turtles. Who ever knew that turtles could be so affectionate? And that turtles could be so fast? And that people could potentially develop real and strong relationships with turtles like they would a dog or a cat? It’s amazing. This is in large part due to my mother’s nurturing. She takes care of the turtles. She cleans their tanks every week, feeds them every day (sometimes with fresh fish from the supermarket) and plays with them every day. This is where Turtle Dance Music comes in. I see my Mom’s relationship with her turtles being parallel to how we want to interact with children and parents. We want to build strong relationships. We want to play, have fun, and discover exciting new things together. We celebrate nurturing. We celebrate turtles. We celebrate affection. We celebrate our parents. We celebrate joyful, shared experiences. We enjoy seeing people and animals do things that we never thought they could do. We love to play. We love to be joyfully surprised by our interactions with people and animals. We love to learn. We love to see people and animals grow. It is a beautiful process. And Rex never bites. You can pet his chin. He is wonderful. I wonder if other people have amazing animals who transcend normal expectations like Rex does? Have you ever had a pet like Rex?